After four years of marriage I wanted my family to meet my husband, so over the 1978 Fourth of July weekend my husband and I flew from California to New York. At La Guardia Airport we found a bus strike. How would we get to Manhattan? Taxis were expensive, and our family couldn’t pick us up. A very dignified, somewhat stocky, nicely dressed man overheard our dilemma, and explained how to catch a commuter train. Then he offered to share a cab to the train depot. In the cab we chatted; he’d just returned from an opera singing engagement in Italy. I was amazed, as my family loves concerts, musicals, and ballet, and I sing and play the guitar. 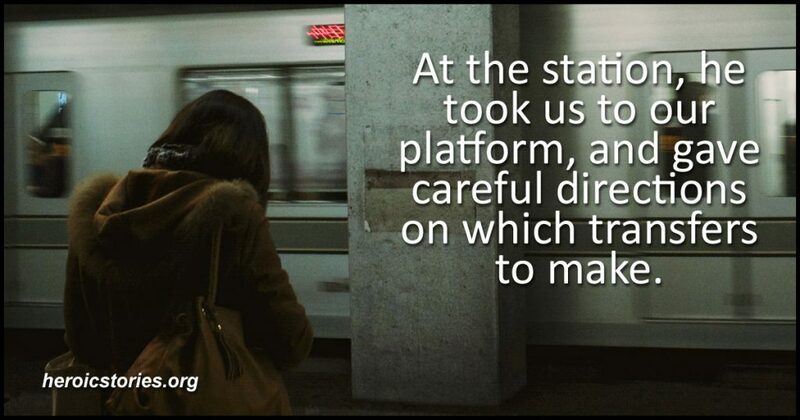 At the station, he took us to our platform, and gave careful directions on which transfers to make. The train arrived; he waved and departed. In two hours we were safely at my cousin’s apartment. We had a lovely visit, but I wished I’d gotten our benefactor’s name and number to let him know we’d arrived, and thank him once again. 26 years later, in December 2004, I was singing with “Threshold Choir”. We sing to provide comfort to bedridden people who are injured, ill, or in comas. A member of my church, “Alice”, was in the hospital, recovering from shoulder surgery. My two choir companions and I found Alice’s room on a floor we normally didn’t visit, and delighted her with our music. As we left, a nurse told us another patient had heard us and requested that we sing for him. She said he’d been in the hospital a while and was somewhat depressed. When we entered the room, the patient was propped up in bed, with an IV drip in his arm. In his mid-40’s, he was quite pale, with bright blue eyes, and rumpled brown hair. He greeted us with a warm smile, and thanked us for taking the time to stop in. We sang a few songs from our repertoire, and then asked him if he had any requests. “How about ‘Silent Night’?” he asked softly. As we sang the old carol, he joined us in a rich tenor. We complimented him on his voice, and it was as if a dam had burst. He regaled us with stories of his love of opera, of his life as a singer, and how his parents had introduced him to all the great operatic performances of the time. He sang us bits of arias in French, German and Italian, and his face took on a healthy glow of joy and reminiscence. Suddenly I realized I had experienced a sort of full-circle miracle. By bringing compassion to this stranger, I’d returned the long-ago favor from the New York opera singer’s kindly transportation help. In addition, I’d received the gift of watching this man transform from someone debilitated by illness to someone transported by joy. And all it took was a simple Christmas carol. Wonderful story! The kindness of strangers, music, and memory combine to create something inspirational that’s value is in keeping us aligned with the best in and of us, so we don’t ever lose hope. Thank you so much for this. I know I need it. What goes around, comes around and many times in ways we would never imagine. Don’t forget we often cross pass with people we are meant to . But don’t know what until some bit of fate or magic brings us full circle. And we save each other again .